Akathisia is a condition that causes intense feelings of restlessness. People with akathisia often pace or fidget uncontrollably (x). There are several types of akathisia, and medication causes most of them. 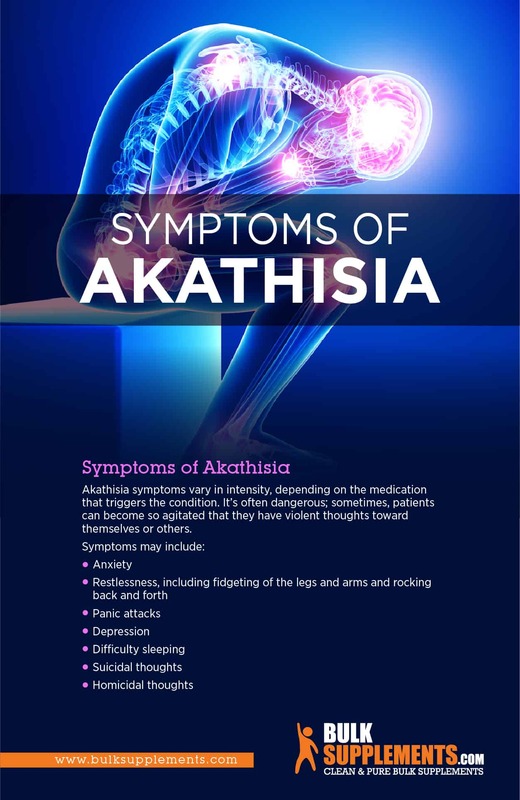 Other conditions closely resemble akathisia, including restless legs syndrome, anxiety and mood disorders. Unfortunately, this makes misdiagnosis common. To diagnose this disorder, doctors examine patient histories with the help of a checklist. This allows them to determine which type of akathisia the patient may have. Acute akathisia develops right after a patient starts a new medication and usually lasts for fewer than six months. Tardive akathisia develops long after a patient starts a new medication. This form of the condition is often difficult to diagnose. Withdrawal akathisia develops when a patient stops taking a certain medication. It can manifest months after the last dose. Chronic akathisia may develop at any time when a patient takes a new medication. This form of akathisia lasts for more than six months. Akathisia symptoms vary in intensity, depending on the medication that triggers the condition. It’s often dangerous; sometimes, patients can become so agitated that they have violent thoughts toward themselves or others. Akathisia usually develops after taking certain medications, and some drugs are more likely to cause it than others (x). The numbers are shocking: 50 to 80 percent of those taking one group of antipsychotic drugs will experience this condition (x). Some antidepressants may cause it, as well. Withdrawal from illegal drugs such as cocaine causes a host of side effects including akathisia. The condition is also common in patients with Parkinson’s disease or brain injuries. To treat akathisia symptoms, doctors may direct patients to stop taking their current medications, or to start taking new medications. Beta-blockers have also been found to help patients manage their symptoms. Vitamin B6 may help, too (x). 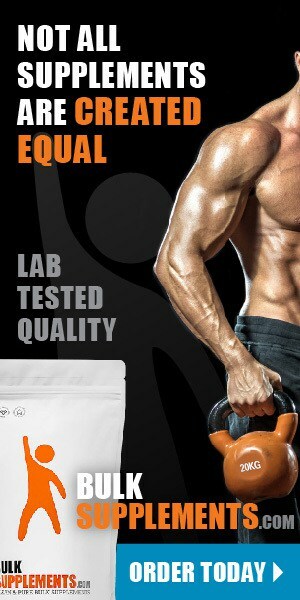 It’s found naturally in a variety of foods, including beans, meat and vegetables. You can also add vitamin B6 supplements to your diet, although you should always speak to your doctor before taking any new supplements. 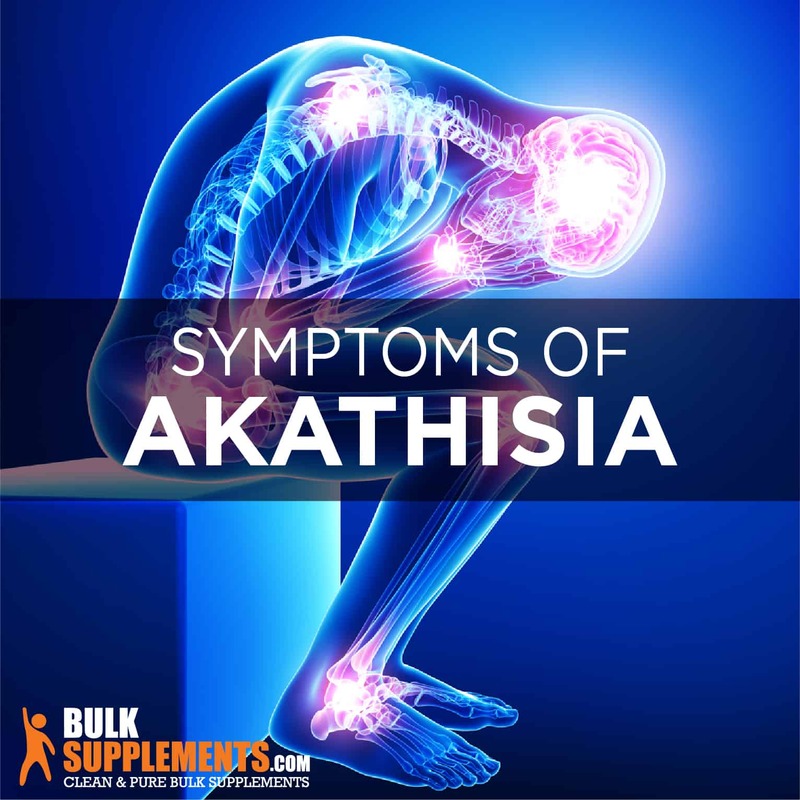 Many natural supplements for anxiety could also help relieve akathisia. Research shows that magnesium supplements may also alleviate anxiety, as will vitamins A, C, D or E (x). A healthy diet plays an essential role in relieving anxiety and related conditions like akathisia. If you have akathisia, avoid processed foods like white bread and sugar, and steer clear of coffee–it can make your anxiety worse. Akathisia is a condition that causes agitation and restlessness, often as a result of taking certain medications. Symptoms are often debilitating and dangerous.